I don't own one, but I love polaroid cameras. Maybe it's because of it's vintage-y feel or their quirky design, but I'm definitely lusting for one - despite their hefty price tag! Also, polaroids look amazing when hung up! I think it's kind of weird how although technology has advanced to things like digital cameras that enable you to take and delete as many pictures as you wish, somehow we still go back to the old fashion things. I think it'd be awesome & am currently lusting for one! 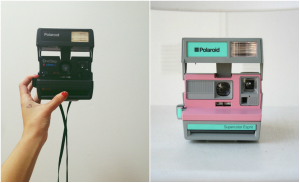 What is your take on polaroid cameras?